Summer is no longer lingering here in NY. As the weather has become crisp and chilly - as fall should be - my focus lies on two things. First, making the house feel warm and cozy. We begin to enjoy dinners by candle or oil lamp light. Thick, yummy blankets come out of their summer hiding places to snuggle with us on Friday “movie nights”. Second, I shift how we nourish ourselves. The Instant Pot is out on heavy rotation as I busily conjure up a vast array of chilis, soups and stews. Vast, to keep things interesting for me to make and the rest of the Cooks to eat. At the base of all my wintry preparations is none other then bone broth. It is the foundation of every chili, soup, stew and the like that I make all fall and winter long. Why? In a nutshell, the big secret here is collagen (and gelatin). Collagen is found only in animal flesh and connective tissue and is a fundamental part of bone, containing a large amount of amino acids. Aside from water, it is the most common material found in the body. It makes up 70% of the skin, 90% of bone mass and 90% of connective tissue. Believe it or not, our endogenous production of collagen begins to slow down in our 20’s! Our ancestors practiced nose to tail eating. They never knew when they would have their next successful hunt and couldn’t really afford to waste any part of the animal including skin, bones, hooves, tails and knuckles. What they discovered was that by cooking down the tougher scraps, they were able to draw out all kinds of beneficial nutrients such as magnesium, calcium, and collagen protein. Eating this way is no longer common practice and boosting our collagen is therefore crucial. Bone broth contains the most bioavailable form of collagen. Here is a list of some of the key properties of bone broth. Bone broth helps heal your gut. It contains glycine, and amino acid that helps heal and protect the gut through it’s anti-inflammatory, immune regulating and cell protecting properties. Glycine is also a major player when it comes to detoxification, reducing oxidative damage, enhancing insulin sensitivity, and regulating human growth hormone. Bone broth contains the joint healing nutrients glucosamine and chondroitin. Bone broth aka Mother Nature’s Botox, does wonders for your skin. The collagen in it helps smooth out wrinkles and stretch marks and can even help reverse sagging skin. Bone broth also contains glycosaminoglycans which help keep the skin plump and supple. In addition, bone broth strengthens nails and encourages hair growth. Bone broth helps fight inflammation - glycine, proline, glucosamine and chondroitin all have anti-inflammatory properties. Bone broth is helpful for weight loss. Through its anti-inflammatory and gut healing properties, it allows your body to maintain a healthy GI tract which in turn helps facilitate weight loss. For more on this look into The Bone Broth Diet, popularized by Dr. Kellyanne Petrucci. It combines clean, anti-inflammatory eating with intermittent fasting and bone broth. Glycine found in bone broth is a sleep aid. It works on the central nervous system to improve sleep quality. Bone broth is versatile, rich, complex and soul satisfying. Want to try making your own? Thousands of recipes can be found online, but these are the beef and chicken versions I make. I use an Instant Pot, but the recipe works in a regular old stock pot or slow cooker as well. Instead of the 2 hours in the Instant Pot, simmer for 12-48 hours. *It is CRITICAL to use high quality bones as it is in the skin and bones that toxins are stored. Go to a trusted butcher and ask for 100% organic grass fed beef bones and 100% organic pastured pork and chicken. *Adding apple cider vinegar to the pot and letting it sit for 30 minutes or more before turning on the heat will help extract the most out of your bones. *For a richer flavor, roast the bones before adding them to the pot. Place the bones and foot (if using) into the Instant Pot. Add apple cider vinegar, and let sit for 30+ minutes. In the meanwhile, chop your vegetables. Drop in the vegetables, bay leaves, and sprinkle with salt. Cover the contents with water, but make sure the pot is not more then two-thirds full. Cover and lock the lid and set to high pressure. Set the timer for 2 hours and let the pressure release naturally. Strain the liquid, discard the solids and place in the fridge overnight. This is simply to let the fat rise to the top and solidify. It makes it a lot easier to skim the fat off the top. Drink the broth alone or add to recipes - even smoothies! To substitute chicken for the beef, use 2 1/2-4 lbs of pastured chicken bones (from another meal or a butcher). You can use a pig’s foot here too, and/or about 6-8 chicken’s feet. Follow the rest of the recipe as written. 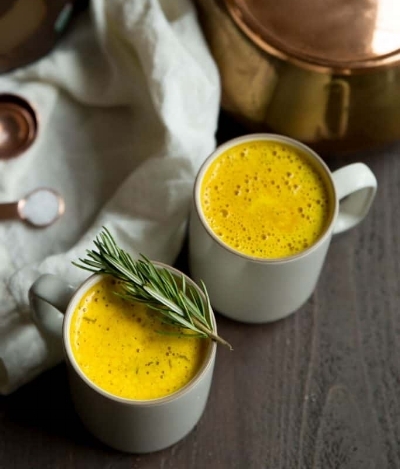 Our favorite way to enjoy bone broth is in latte form, blended with a little grass-fed butter, ghee or extra virgin olive oil, turmeric, cumin, a dash or two of cayenne pepper, sea salt and freshly ground black pepper. Don’t have time for make your own? We like Brodo Bone Broth, available in Wholefoods, Fairway and other grocery stores and Kettle and Fire. “All disease begins in the gut”, said Hippocrates, the Father of Medicine. Documented as early as 400 BC, he recognized the healing powers of bone broth and prescribed it to those with digestive disorders. In 1845 American industrialist, Peter Cooper, secured a patent for powdered gelatin. (Bone broth cooked over a long period of time turns the collagen in the bones turns to gelatin). Other collagen boosting foods include wild salmon, chlorella, leafy greens, citrus fruits, eggs, berries, tomatoes, pumpkin seeds, avocados, garlic, chia seeds. (Full disclosure: There are some affiliate links above. While we make a little bit of money if you make a purchase using our links, it is at no extra cost to you. Rest assured, we honestly wouldn't be recommending them if we didn't believe in them)! THE exercise you need to know to feel young forever.